Our monthly TTE Reading Group is coming up on July 6, 2019. 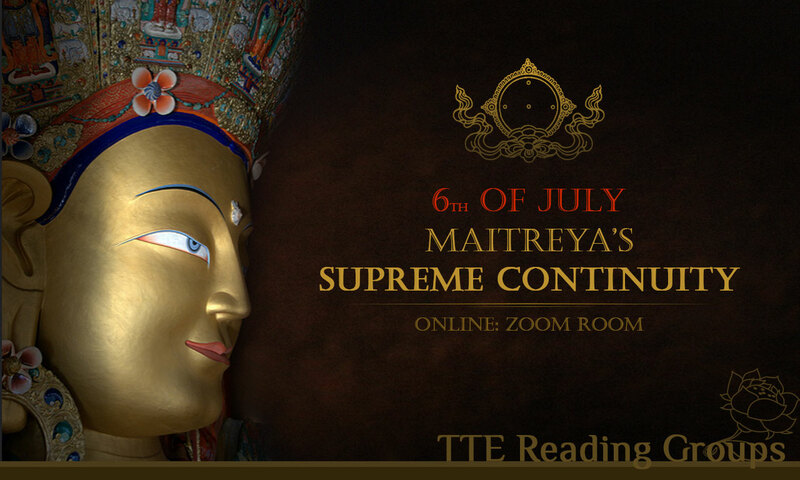 In this online Reading Group we are discussing Maitreya’s wonderful text called, The Supreme Continuity, or The Uttaratantrashastra, and are looking forward to welcoming all Tara’s Triple Excellence participants to join us no matter in which part of the program you currently are. This will not be a teaching situation, rather it will be a discussion group to which we all contribute by sharing passages of the scheduled chapter(s) or asking questions. The internet address of the Zoom room where we will gather online on Saturday morning, March 2nd is http://zoom.us/j/2943528030. Just click on this link and you will be taken to the Zoom session. Alternatively, you can write down the Zoom number and enter it manually in the space provided when you open your Zoom app. The first session will start at: 10:00 a.m. CET (Vienna) Saturday July 6. The second session will start at: 11:00 a.m. EST (New York) Saturday July 6. We are planning to continue to meet on the first Saturday of each month, so the following meeting date should be August 3, 2019. Don’t have an account yet? Click here to create one for free!